Group photo at the Shrine of Our Lady of Prompt Succor, New Orleans, Louisiana. 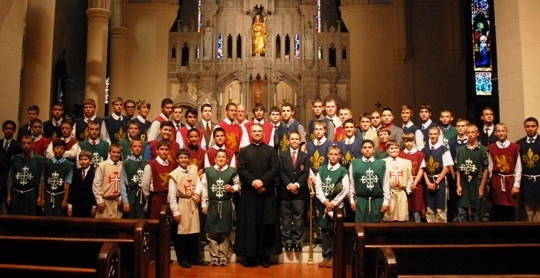 The theme of this year's camp focused on the history and culture of Italy: The fall of the Roman Empire, examples of Holy Popes, The Swiss Guards, the Papal Zouaves, Saint Philip Neri, the Shroud of Turin, Saint Francis of Assisi, the Roman Military Martyrs, the Siege of Malta, and the heroic Battle of Lepanto. In addition to these illustrated talks, the boys also enjoyed hardy Italian cuisine complete with tiramisu and cassata cake. But for many the highlight of the event was the opportunity to put the virtues of chivalry into practice with a campaign in defense of the unborn. Dozens of enthusiastic boys lined the sidewalks of a busy New Orleans avenue where Planned Parenthood plans to build a new abortion facility. Between the recitation of the rosary, camp participants waved signs, flew banners, played bagpipes and drums, chanted Marian hymns and encouraged passersby to oppose the new abortion building project. What a sight. Just as the knights of old defended orphans and widows, the modern-day knight must know how to defend the unborn against the scourge of abortion and stand up for God's Law. "My son Daniel attended his first camp this year and he is a changed young man," stated one parent. Another parent added that her son "has not stopped talking about the camp, the men, their heroic example and the wonderful time that he had. It has been an amazing event in his life, one he wishes would not end. He has been to other camps, but none like yours. Nothing can touch what he has seen at your camp. He is on fire to live and dedicate himself to Our Lady." May God continue to inspire more boys to fight for the greater glory of God with holy boldness, honor, courage and integrity.